Yeah, it rocked just like last time! but somethings were different and new. But you'll have to read on to find out. 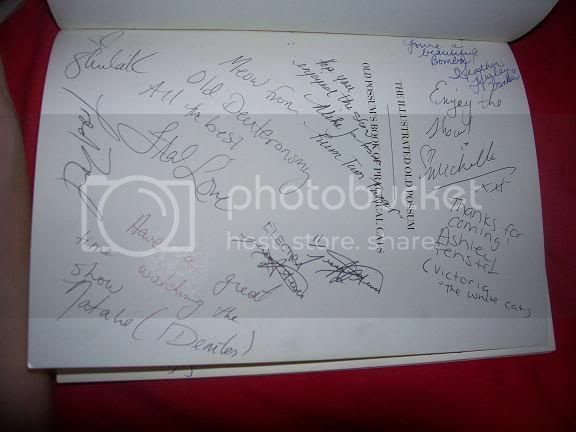 Click here or Click here to see the autographs from my second and third expereince. CATS was awesome AGAIN! I got more autographs. I got some more autographs. I got some from Electra (which i already had a didn't know :S) Skimbleshanks. Sillabub and I think that's it. When we walked into the theatre, one womans like, "Look honey a cat!" And I'm like in my head, "That's right." lol I'm vain like that :P Just kidding. And from there on, it was cool. The people that worked at the theatre all said I was sooooo cool for making my own costume and wearing it here. they also said that they loved my costume. Jellicle Songs for Jellicle cats: This song was just like last time, i don't rememeber anything being to different.. The naming of cats: Same as last time no new things. The invantation to the jellicle ball: It was same as last time, I don't know if I ever said this in my other one but instead of Mistoffelees coming out Coricopat came out. The Old gumbie cat: Same as last time. The Rum Tum Tugger: Same as last time. Excpet at the last "About!" He's like, I love this part, then he said "ABOOUUUUUUUUT!" Grizabella the Glamour cat: Same as last time. Butsopher Jones: the cat about town: Same as last time. Mungojerrie and Rumpelteazer: Same as last time. Old Deuteronomy: Same as last time. The Jellicle ball: Same as last time. Memory: Same as last time. There was another person dressed as a cat. She was dressed ast he jappeness Demeter, Her costume was better cause her wig was better and her unitard was better quality. She was really nice. We sat on the stage with Old D till intermission was over. We just talked and said hello to everyone who came on stage. She was really nice. Forgot to ask for her name. She said she was part of a costuming thing on the net. i looked it up but it confussed me. EDIT: I now know who it was I met. Her online name is Saffity. She makes wicked CATS costumes. The moments of happiness: Same as last time. Gus the Theatre cat: Same as last time. Growltigers last stand: Same as last time. Skimbleshanks the railway cat: Same as last time. Macavity: the mystery cat: Same as last time but, the actor who played him last time, didn't look the same this time. My nana thought he was probably a stand in. Mr. Mistoffelees: Same as last time, except when he did the straddle jumps, he didn't jump as high. Up to the heavyside layer: Same as last time. The ad-adressing of cats: Same as last time. After the preformance: It was cool, we stayed later and got autographs from the cast. Met some of their familys. We could've gotten pictures with the cast and on the set, but the batteries in both camera's died! I was so pissed off! >( When we went outside I was just standing around, dancing al sorts of stuff, to people from the theatre who worked there walked by and said, 'i love your costume." and the other girl said, "Me too." i was very pleased with myself.